It's a busy time in the world of rugby. 2019 sees the Rugby World Cup take place in Japan, and next year's annual Six Nations Championship is just around the corner. 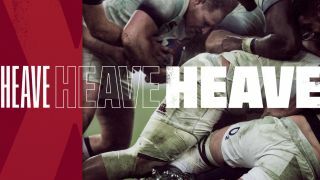 Ahead of these events, Engalnd fans just have enough time to get used to the recent rebrand of England Rugby courtesy of London-based studio Onwards. Created to encompass everything from poster designs to social media platforms, the new look is centred around diversity. England Rugby, formerly known as Rugby Football Union, was keen on the idea of diversity because it reflects the changing and more inclusive nature of the game. What was once seen as an upper-class, elitist sport has evolved into a more open and multicultural game. To get this message across in its rebrand, named 'The Game of Our Lives', Onwards developed an identity based on a timeline device. "This linear system creates a home for storytelling in the brand, enabling us to showcase in a huge array of diverse content - from social posts to grassroots imagery to elite footage, while always remaining on brand," says the studio. These themes are brought to life with imagery from social media and the sans-serif typeface Tusker Grotesk. This typeface is used throughout the branding in a range of weights and styles to communicate that people of all shapes and sizes can get involved with the game. Its bold style also reflects the tough nature of the game, with different textures and layering systems evoking its rough and ready nature. Fans will be relived to see that the logo of the England rose has remained unchanged. The red and white's distinctive colour palette has also been retained, by and large. England Rugby's head of brand, Ed Curran, is confident that the new identity is the perfect showcase of where the sport is at the end of 2018. "Onwards have designed an outstanding identity that enables us to communicate flexibly to all our audiences and has breathed new life into our brand. "As an organisation we have a wide remit and this new brand gives us a platform to speak in a far more engaging way to supporters and players alike."